First, this simple book page fall banner created by Dream Design DIY is so simple but absolutely beautiful. I love how it’s used in the picture below hung within a frame which is displayed on a hallway dresser. But, I can also see this displayed in front of a mirror or above a fireplace or even above an entry door. Change up the wording too! Looking for a way to add fall colors to your home decor and some inspirational thoughts too? Then, try creating your own fall printable sign. Find a quote, poem or inspirational message that you love and create an easy graphic to go with it. I love using Canva to create all of my graphics. You can frame your graphic or leave it unframed. 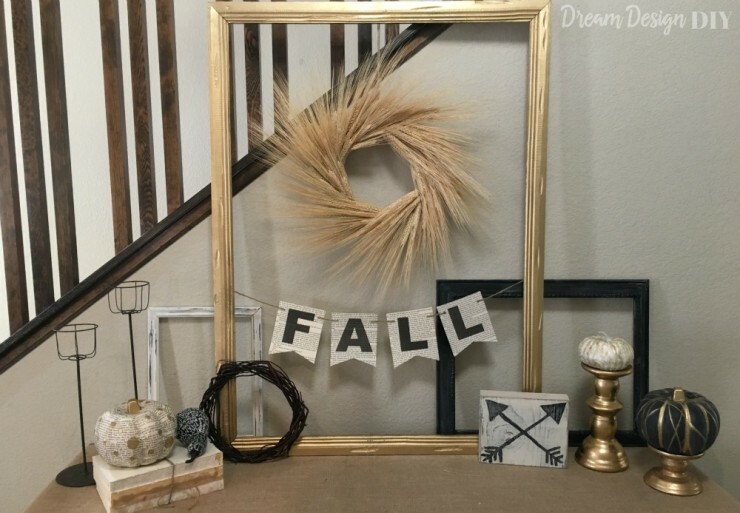 Next, add your printable sign with a few other fall items to create a little vignette. I like adding a fall sign to my front hall as a way to welcome by guests to my home. Super cute DIY project to try! Heidi at Happiness is Home has the complete instructions for this project. I can see myself using real leaves that I can collect with my kids, maybe felt or even newspaper cut-out leaves to duplicate this project with. 12 creative fall DIY projects to inspire you today. Burlap is a very affordable and easy to find material this time of the year. I find that burlap adds a rustic feeling when adding to your home decor. 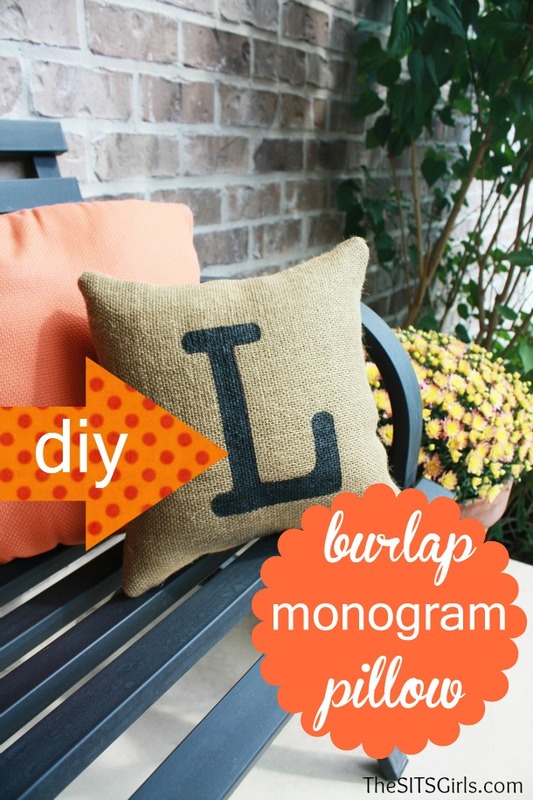 Creating your own stenciled monogram pillow is an easy project to do. Simply, follow the SITs Girls instructions. You can also modify this project by using a sharpie pen. 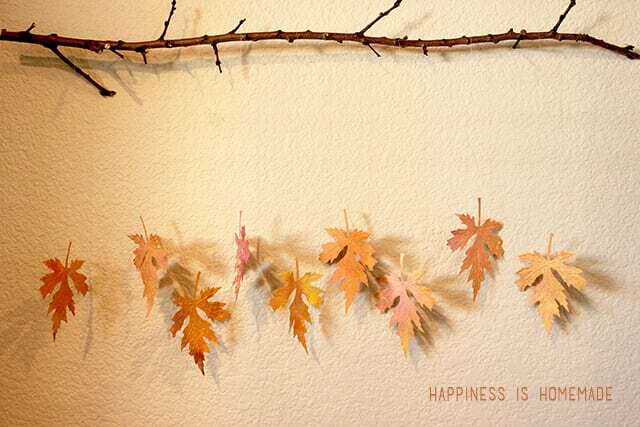 You can simply stencil a letter or a quote or a few fall items like pine cones or leaves. If you don’t want to make a pillow, I can see changing up this project by creating place mats or a table runner. Use your imagination! Also, why not add a special touch to some of your pumpkins on display? I love the simplicity of this next project. Use a sharpie pen or a gold or silver metallic pen and add some calligraphy writing on your pumpkins. White pumpkins look great in any vignette and colour scheme. You can find some calligraphy writing tips all over Pinterest. Chrissy at The Perfect Palette makes this project look so easy. This next creative fall DIY project requires a few materials that you can easily find. 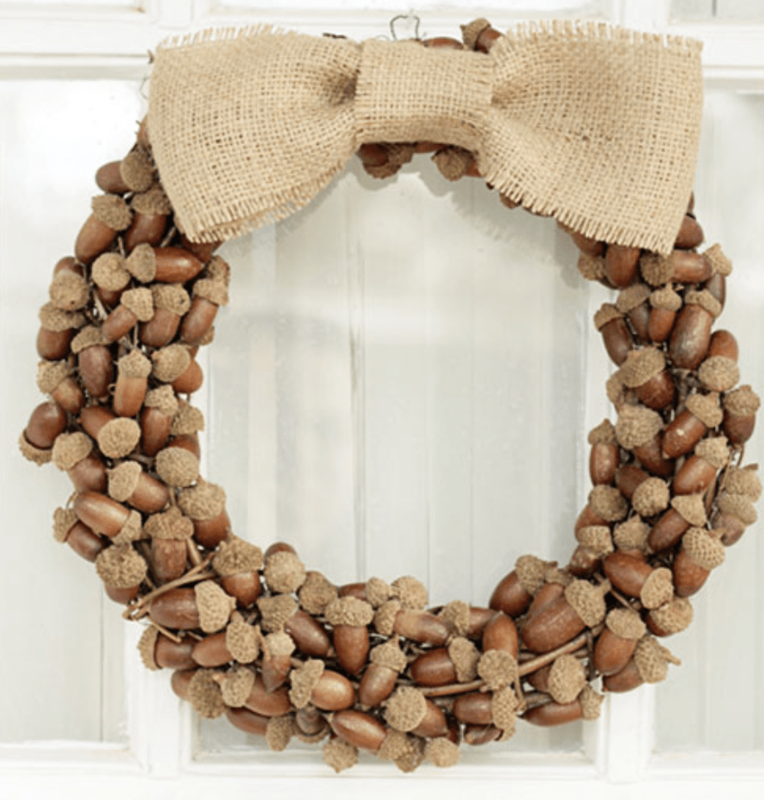 Use a simple vine wreath, some acorns or even pine cones and some burlap and you’re good to go. I like the natural earthy tones of this wreath and I can see adding it to my front door or over a mirror. I would also consider spray painting the acorns in white or even adding some gold to it. Rachel at the Desert Blossom used dollar store foam pumpkins and gourds and some spray paint to create this simple centerpiece. Add your collection to a shallow bowl and tray along with a few garlands or twigs and you have a perfect table decor. Love it! Incredibly, I just saw a similar wreath today at Homesense selling for $50. It looks beautiful in person and will really make a visual impact to your front door or hanging in your home. So, get the full tutorial at The Lottery House. Decorating for fall should be quick, affordable and fun! Next, I found this easy DIY project that will definitely get you in the mood for fall. First of all, decide on your word or phrase and collect some mason jars. It’s incredible how inexpensively you can buy mason jars today. You’ll need some acrylic paints. Change up the colors to fit your home decor. So, have fun and be creative. Create a unique display for a corner of your home or display these jars across a mantel or dresser. As well, I found this pretty project and think it’s incredibly easy to make and very inexpensive. Collect some twigs and add them to a few vases of different heights. Then, add some water (maybe colored) with some floating candles, and you have a simple arrangement for any table. Probably, one of my favorite fall DIY project ideas is creating chalkboard signs. For instance, I love this wood slice chalkboard sign that was created with chalkboard paint. Also, I like creating framed chalkboards using old picture frames. Now, you can find chalkboard liners at the dollar store. Simply, cut out the liner to fit your frame, add some inspiring fall words and you have a perfect rustic sign to add to your space. So, I have now described 11 creative DIY projects that will inspire you. However, one last element to consider when preparing your home for fall is how your home smells. 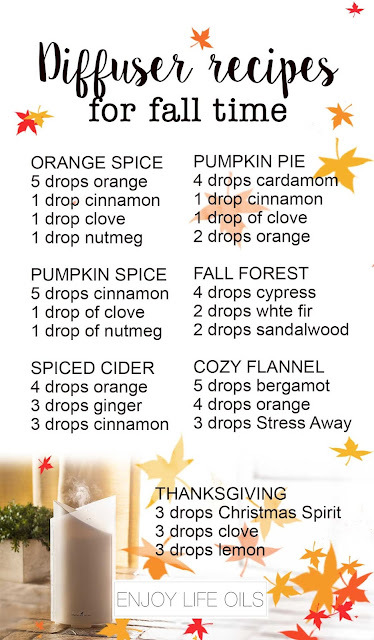 How can you include scents into your living space that will also make you excited about fall? Therefore, my last suggestion as a DIY project is to create your own diffuser recipes to add throughout your home. Hence, here are some easy recipes to try using essential oils. Leigh at Hines Sight explains how to use essential oils easily in your home. keep it simple and rustic. Can’t wait to hear from you! Which of these projects do you love best? Keep sharing the love on social media!